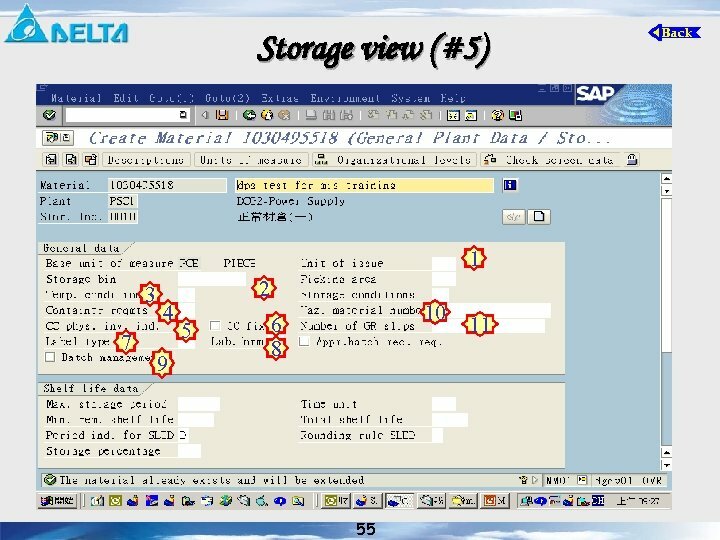 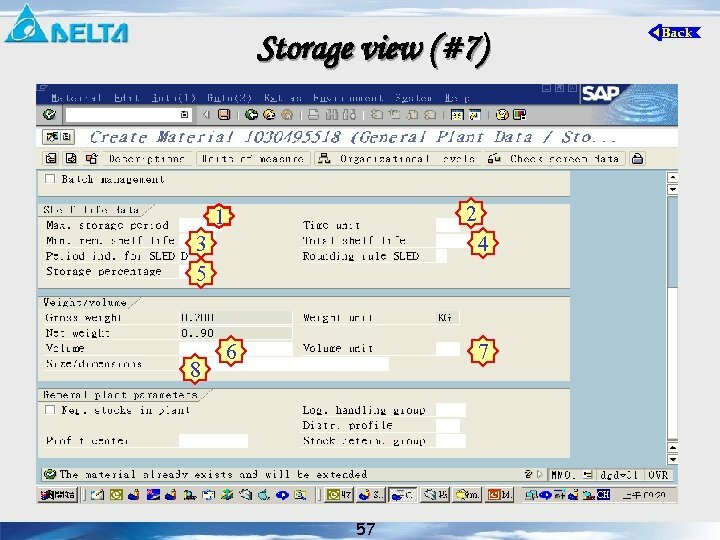 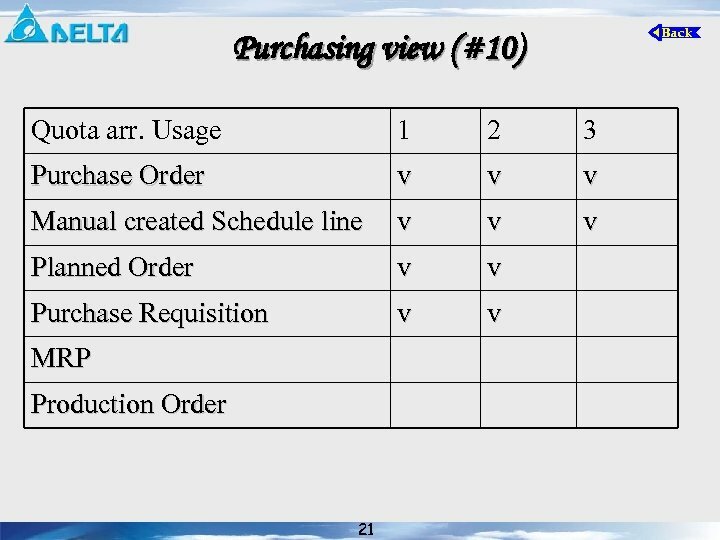 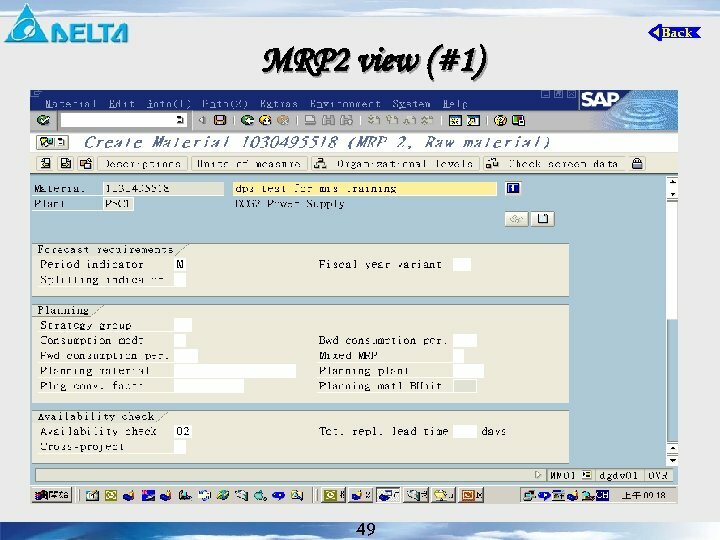 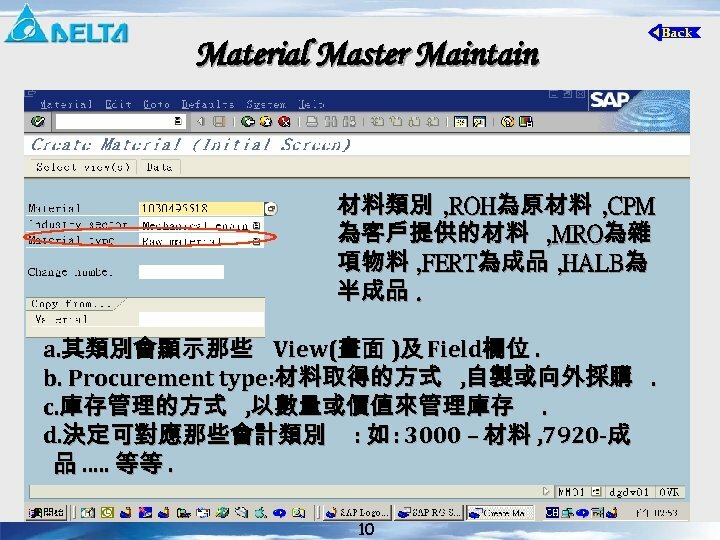 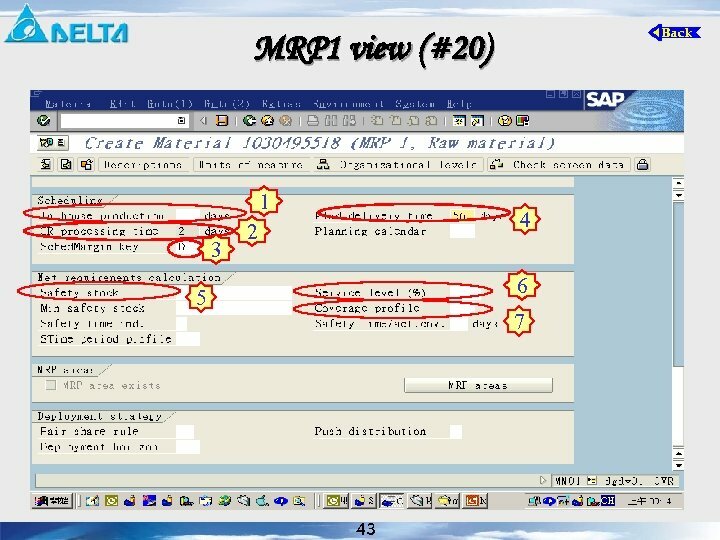 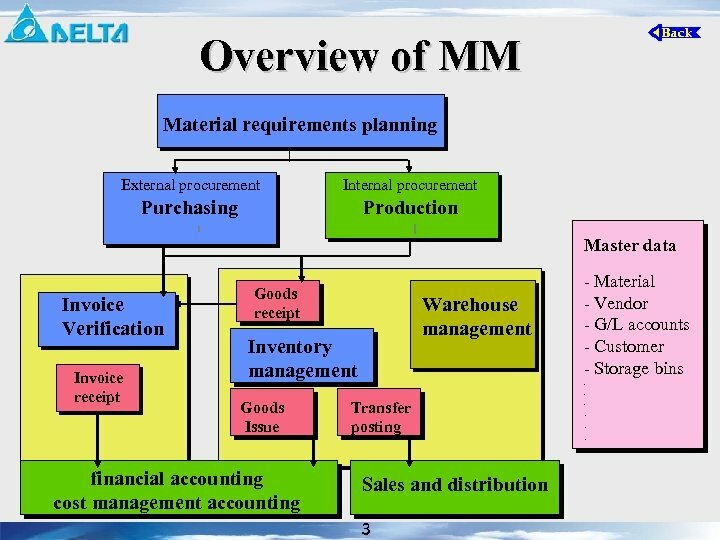 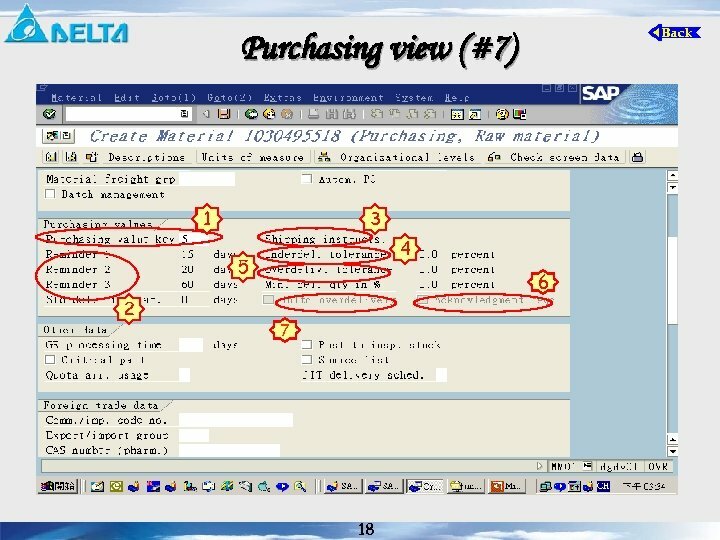 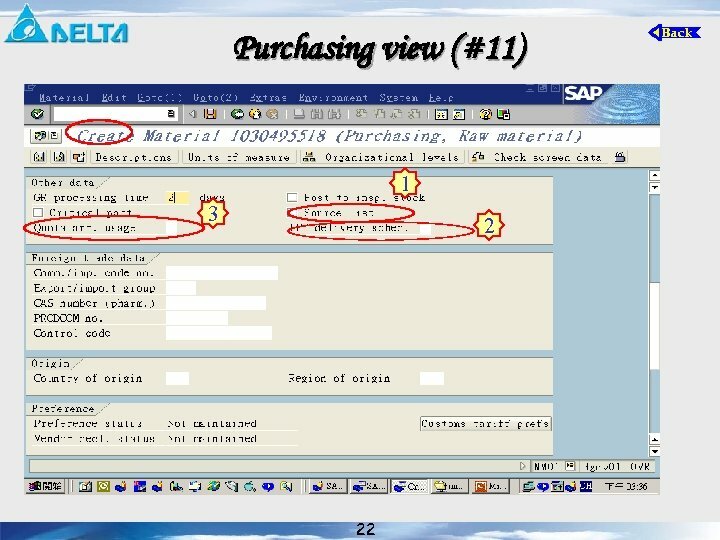 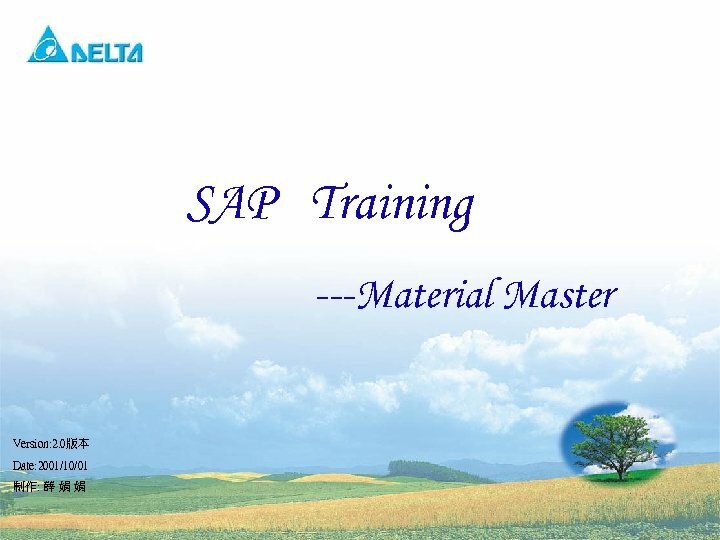 Overview of MM Material requirements planning External procurement Internal procurement Purchasing Production Master data Invoice Verification Invoice receipt Goods receipt Warehouse management Inventory management Goods Issue financial accounting cost management accounting Transfer posting Sales and distribution 3 - Material - Vendor - G/L accounts - Customer - Storage bins. 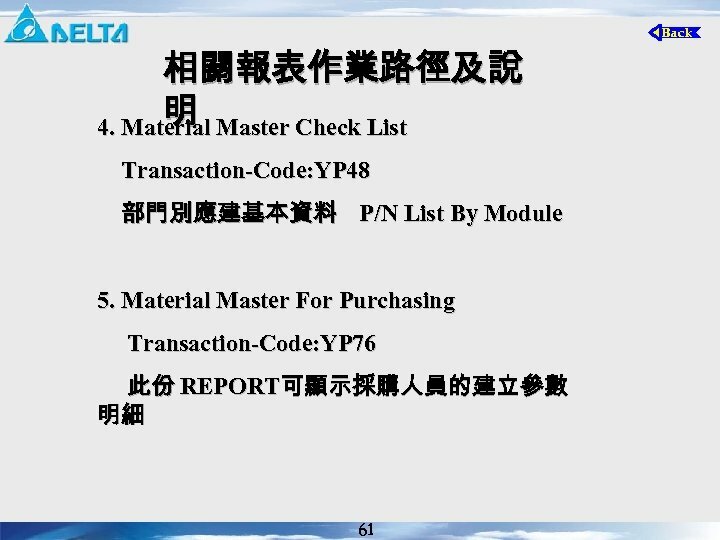 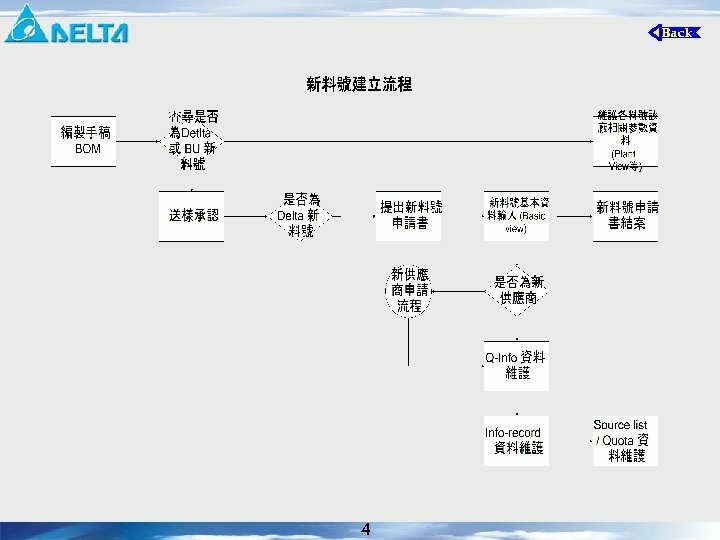 . .
由資料中心維護包含料號及品名規格 及單位等資料 , 此部份的資料需先建立 採購才可以接著維護相關參數 Basic View 由 采購維護 , 主要用以維護採購者代碼 Purchasing View 下 p/o單位 若為材料 , 此資料由採購維護 , 若為成品 /半 成品此資料由生管維護. 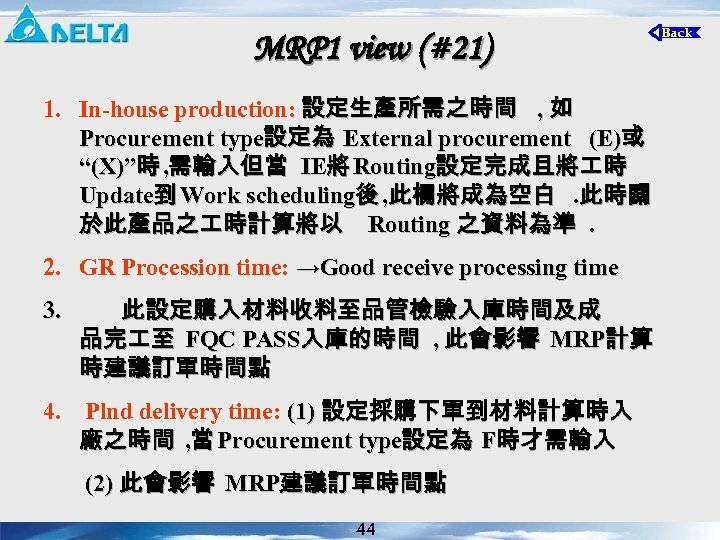 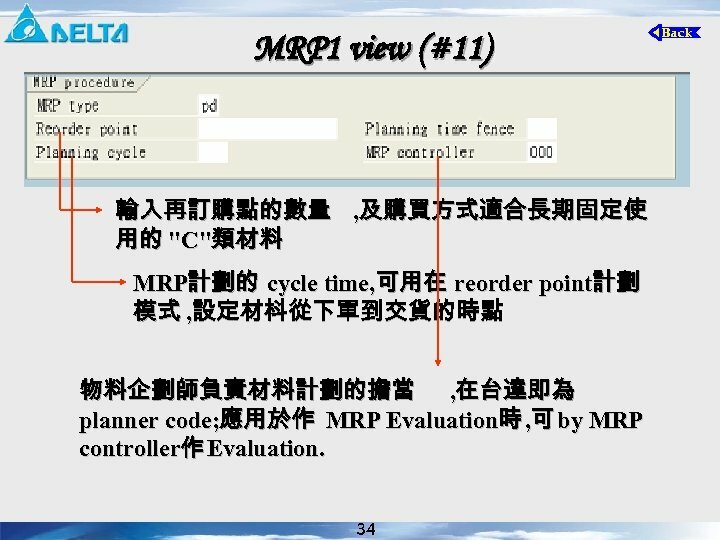 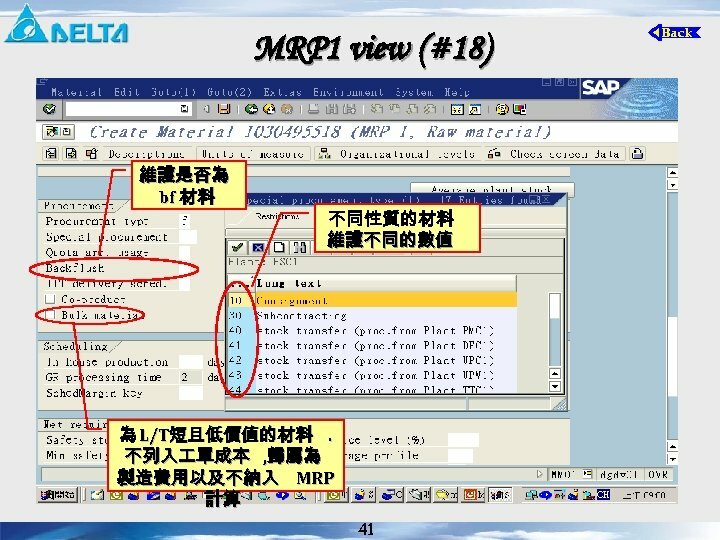 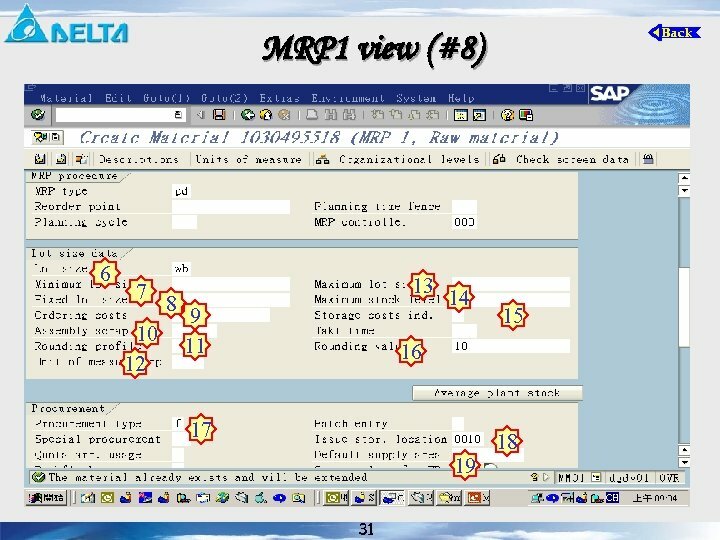 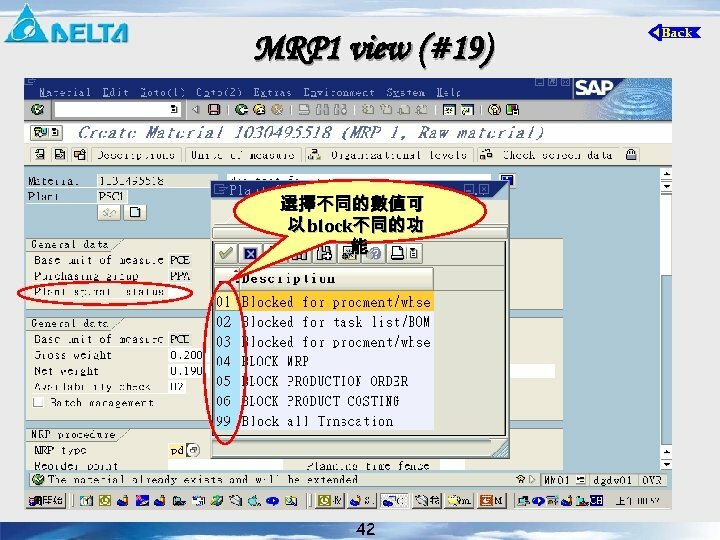 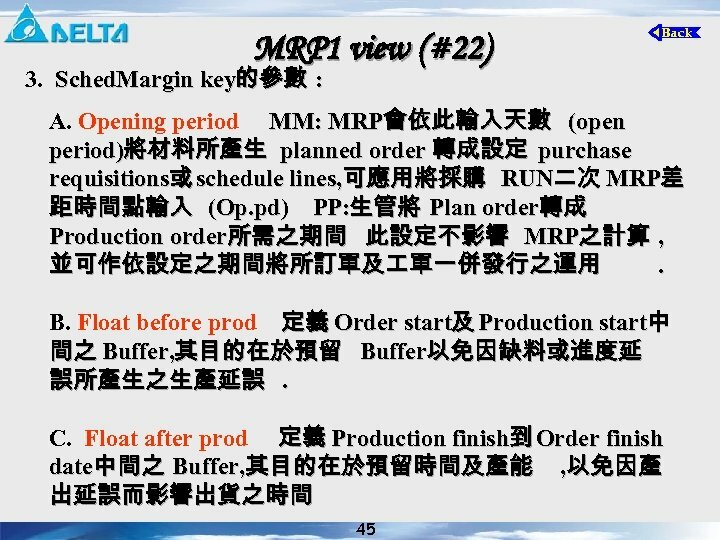 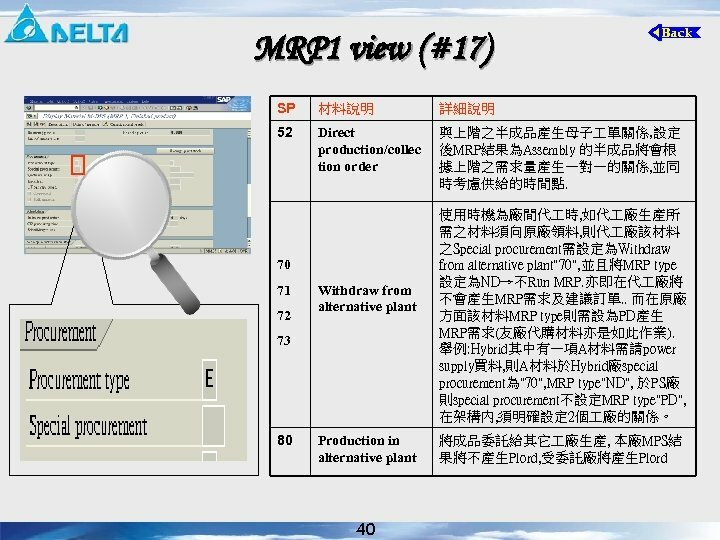 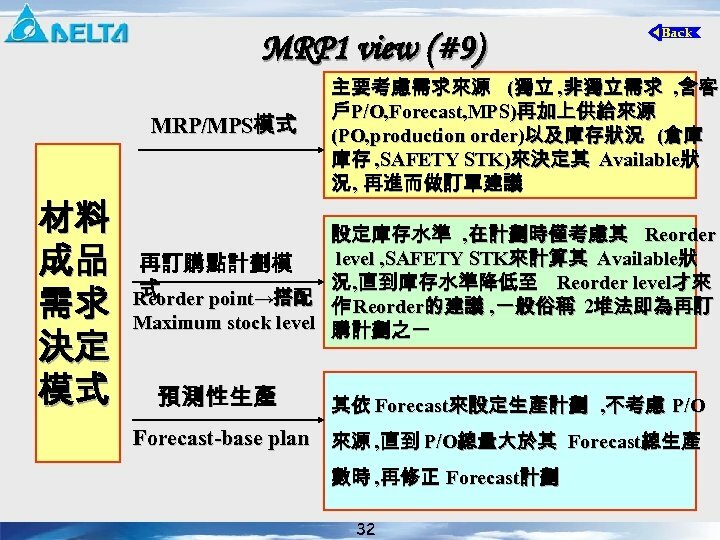 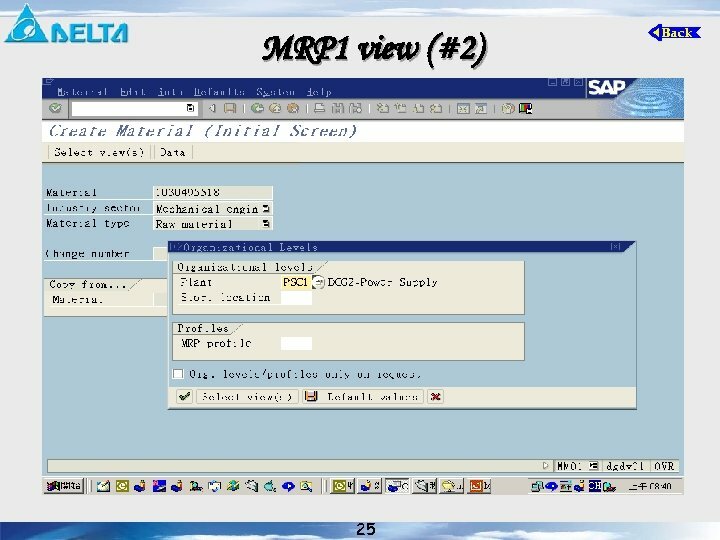 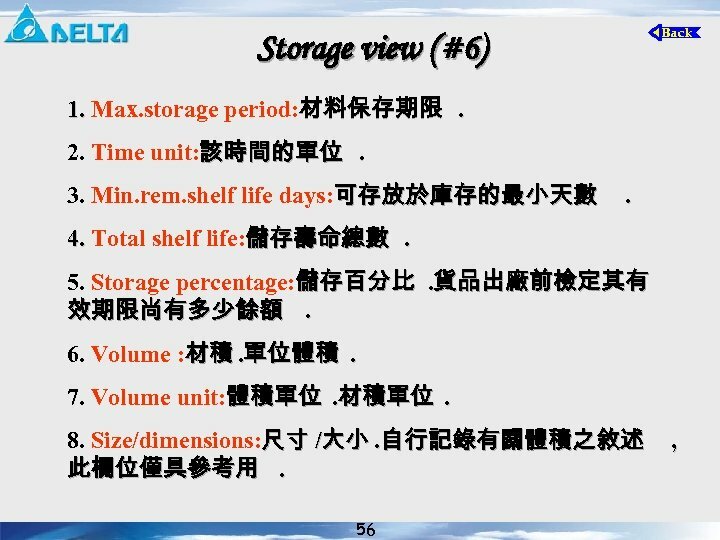 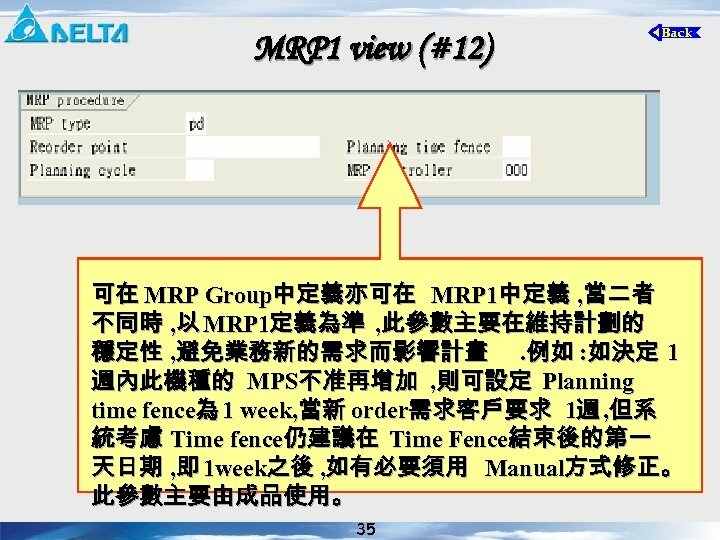 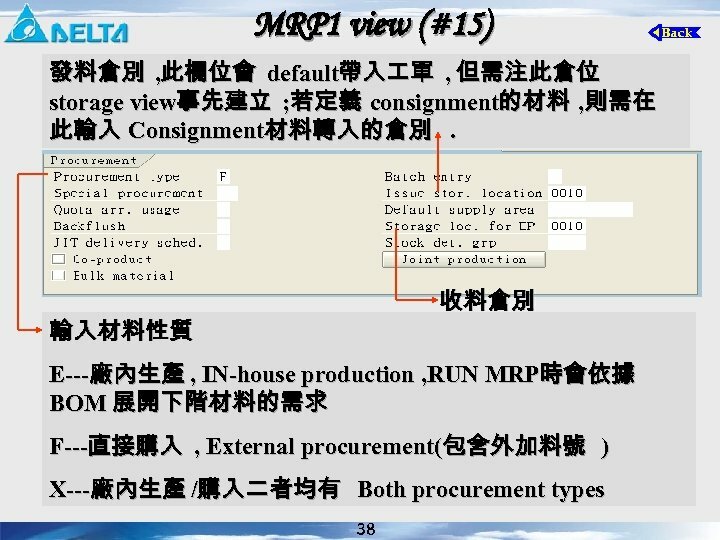 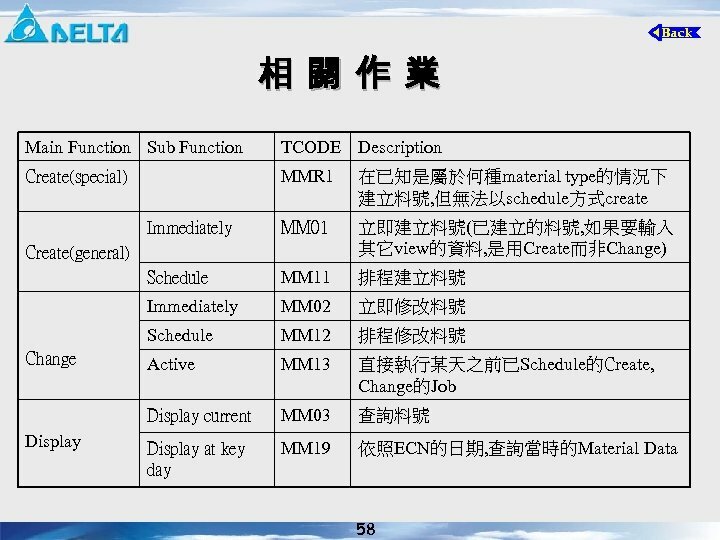 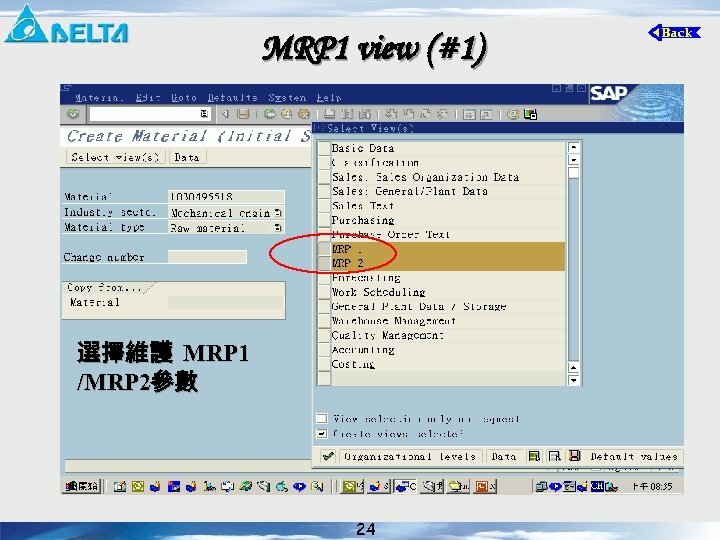 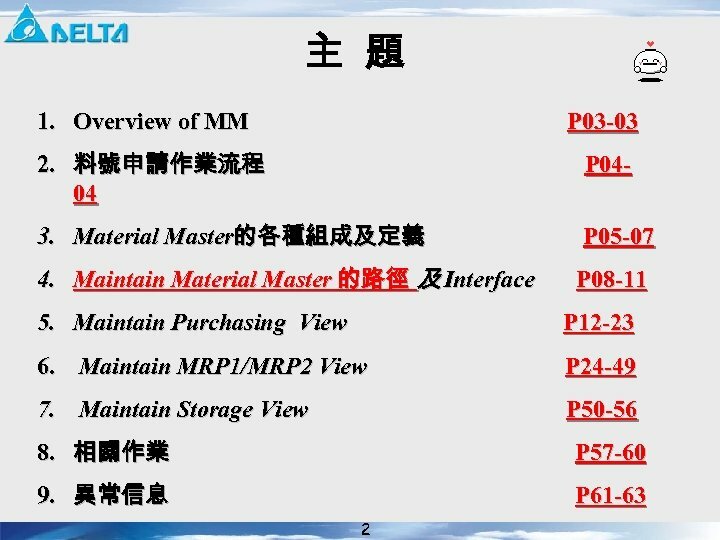 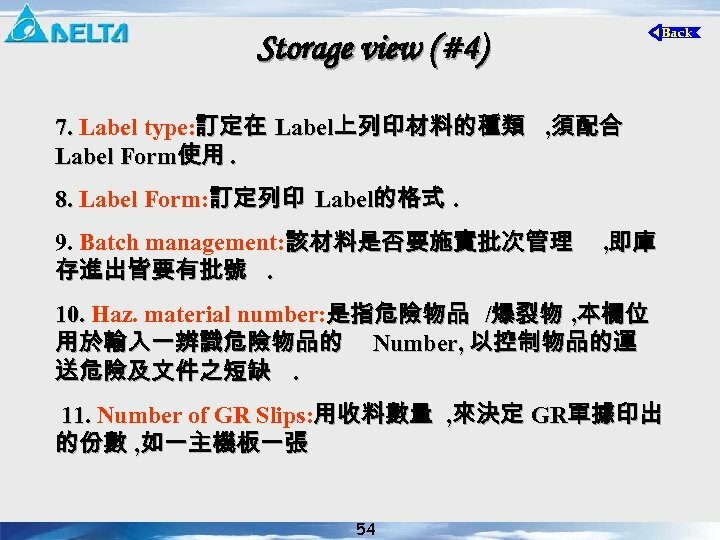 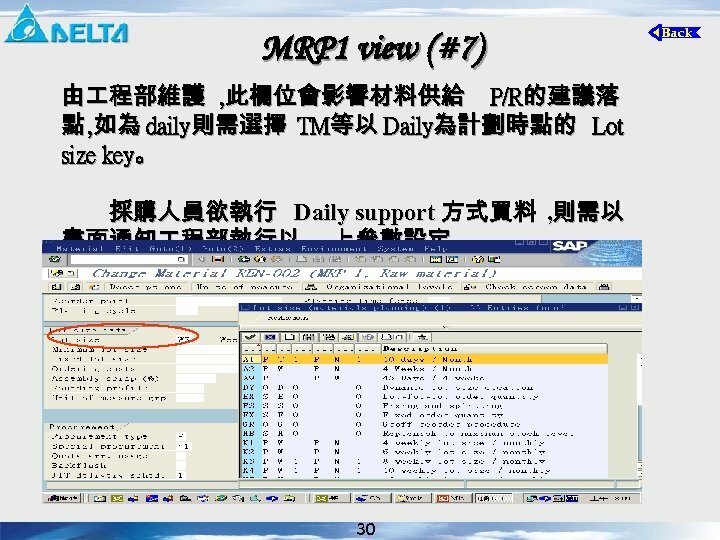 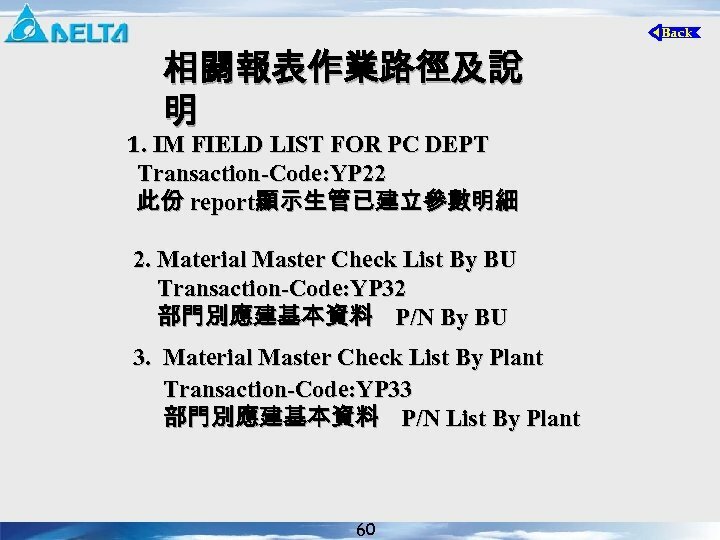 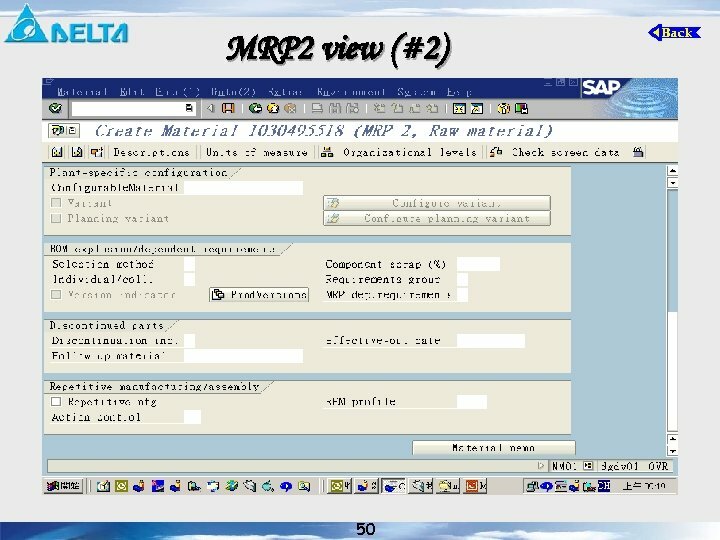 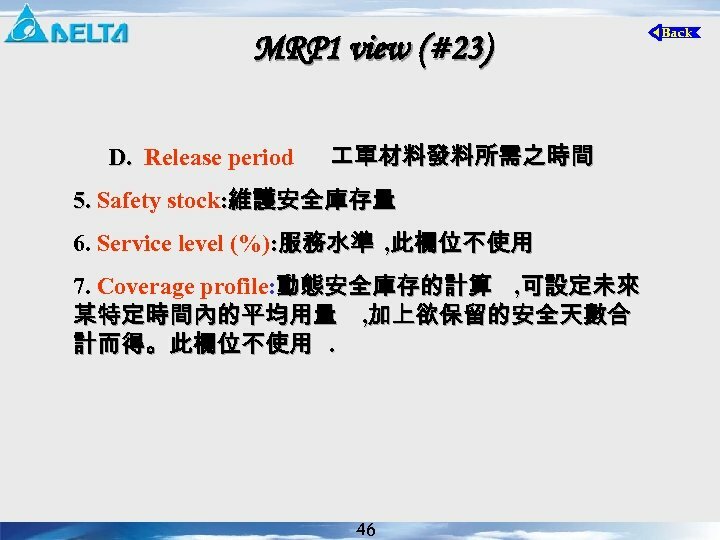 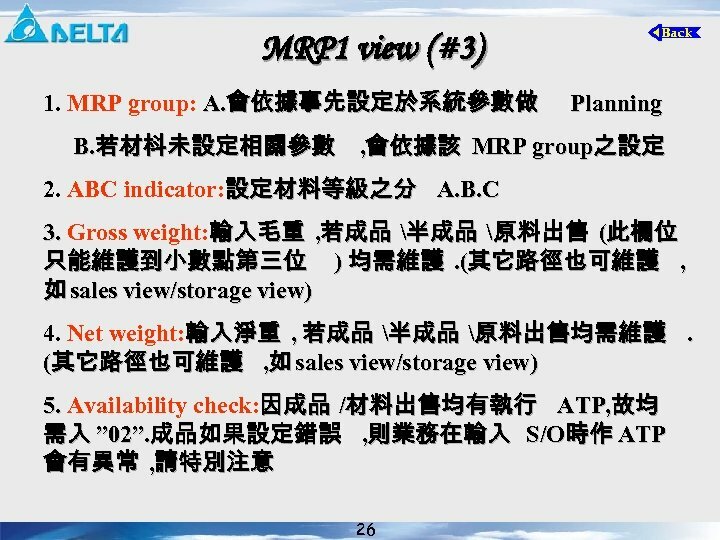 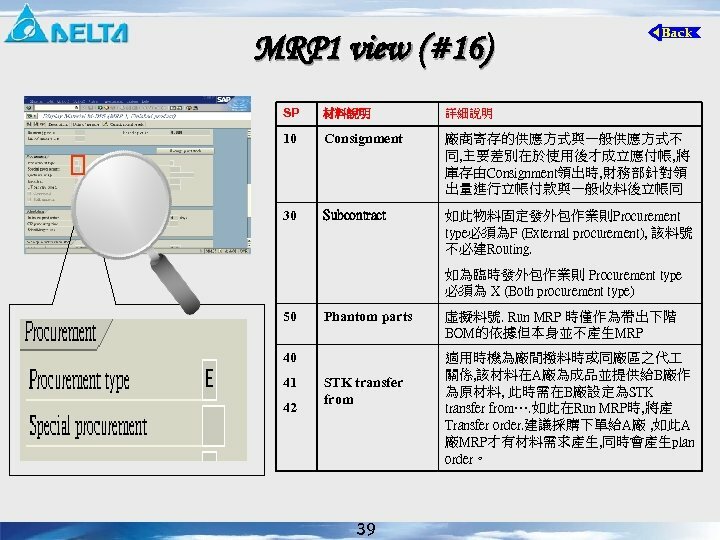 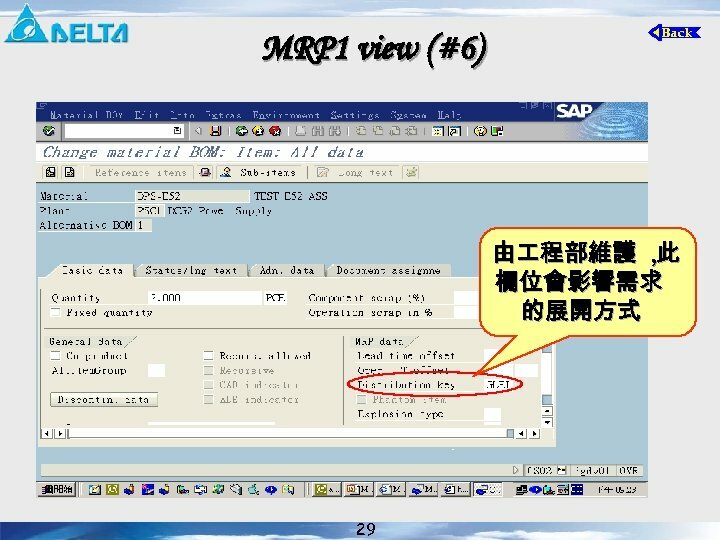 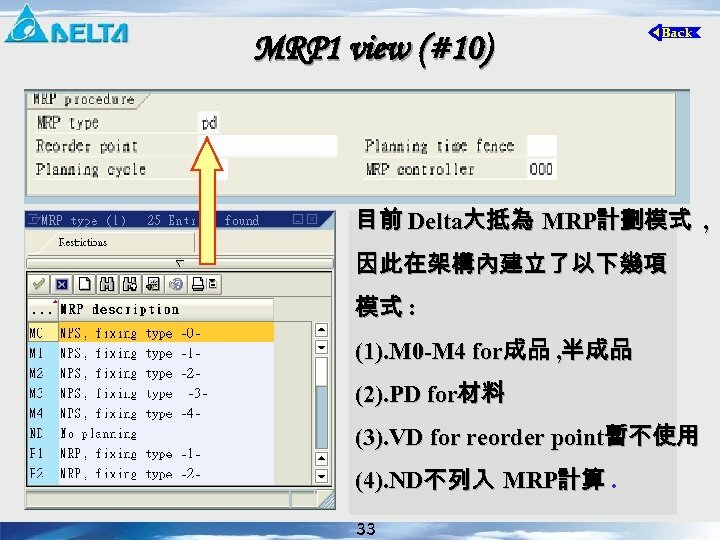 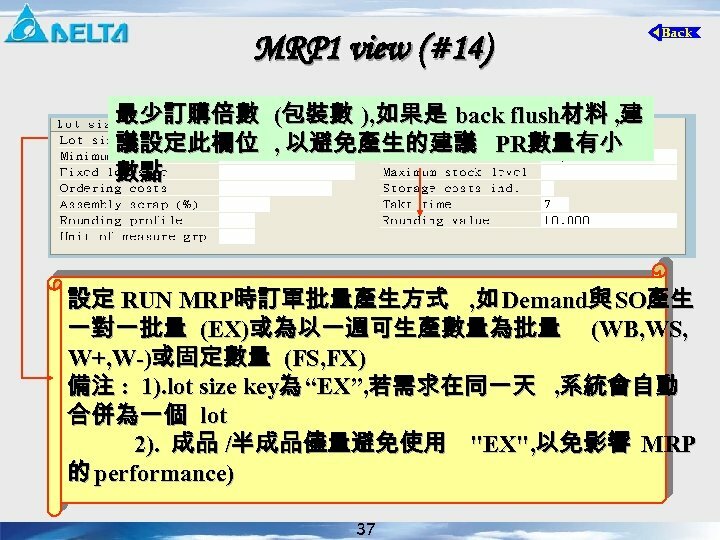 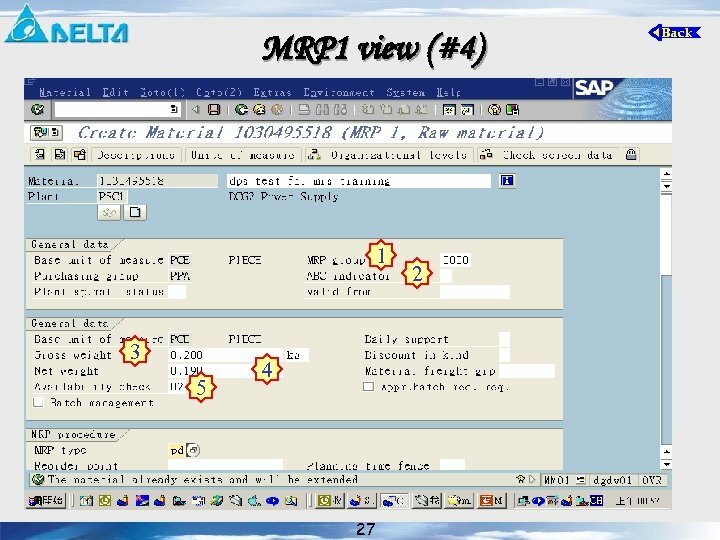 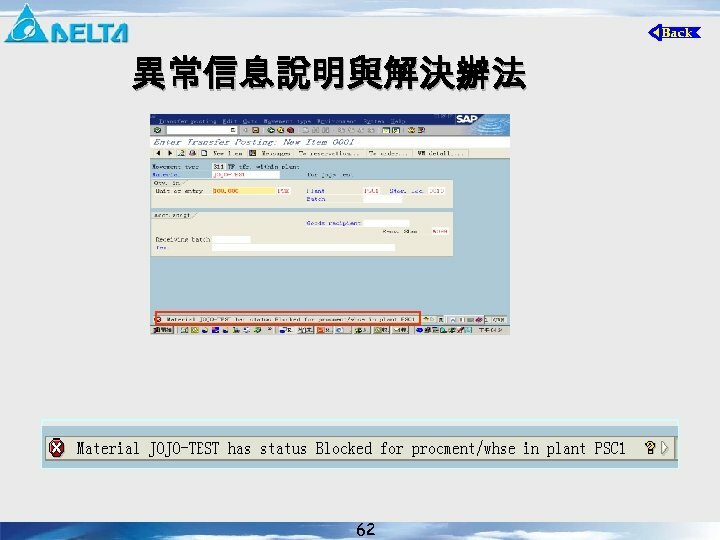 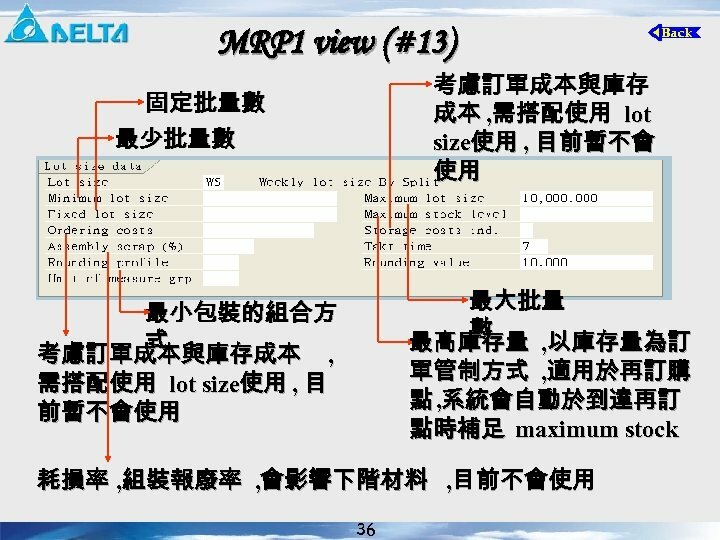 此資料必需維護 好後 , 程部才可以做各廠 Bom的 Allocate MRP 1/MRP 2 Material Master 由 倉庫維護 , 維護材料的架位和倉別 Storage View 由各廠品管部門維護 , 此資料會影響材料 入料及檢驗的設定 , 且會決定材料是否需 品管檢驗 , 是否需 CHECK材料承認 , 材料 若未經過承認採購即無法下單. 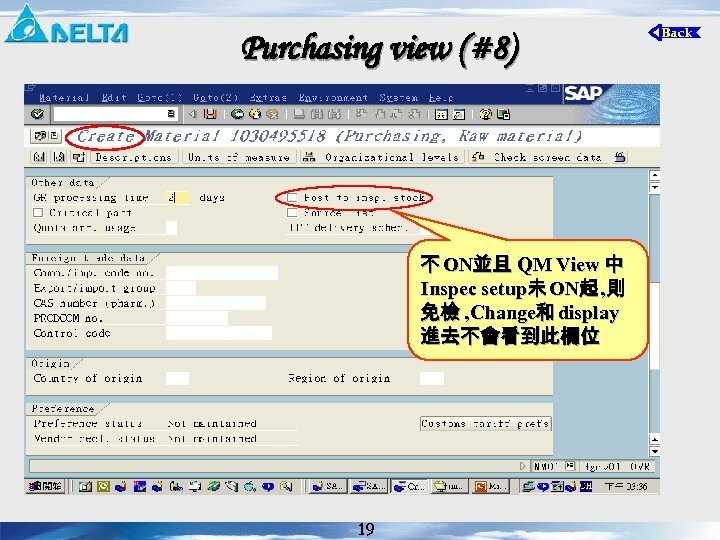 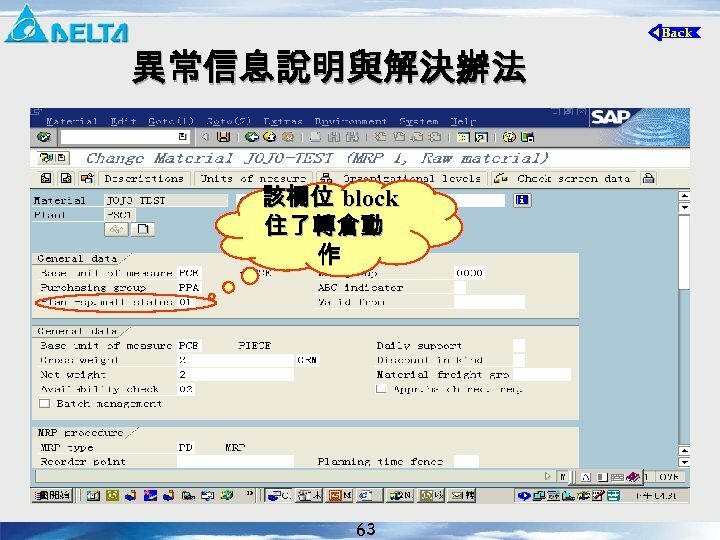 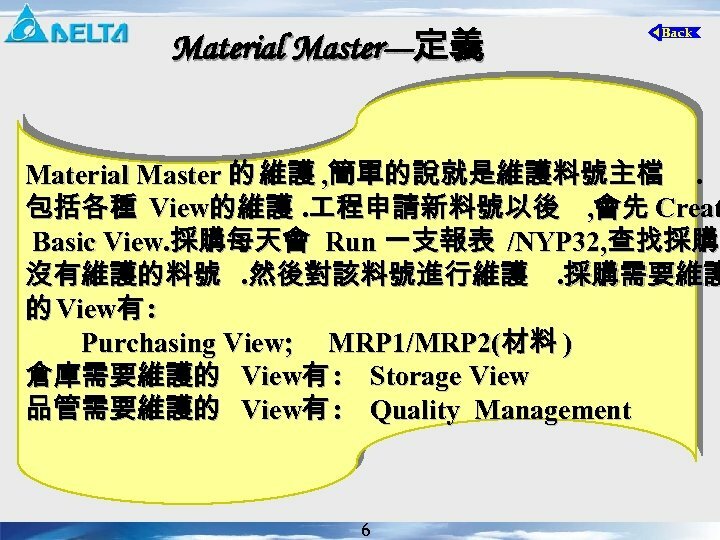 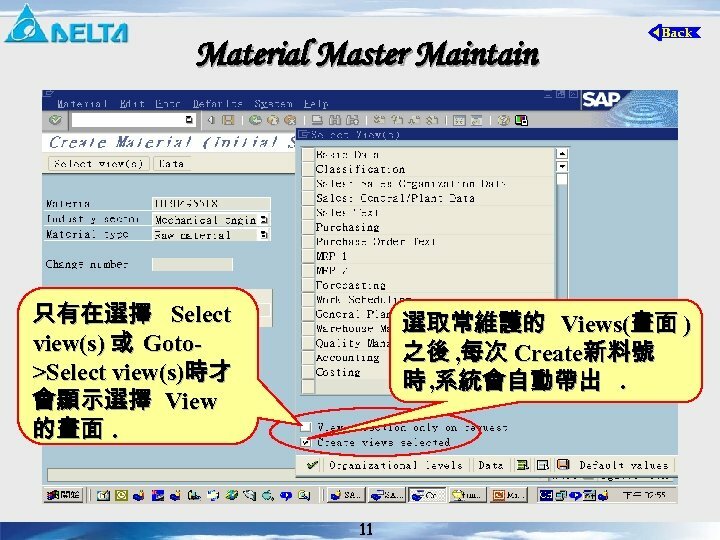 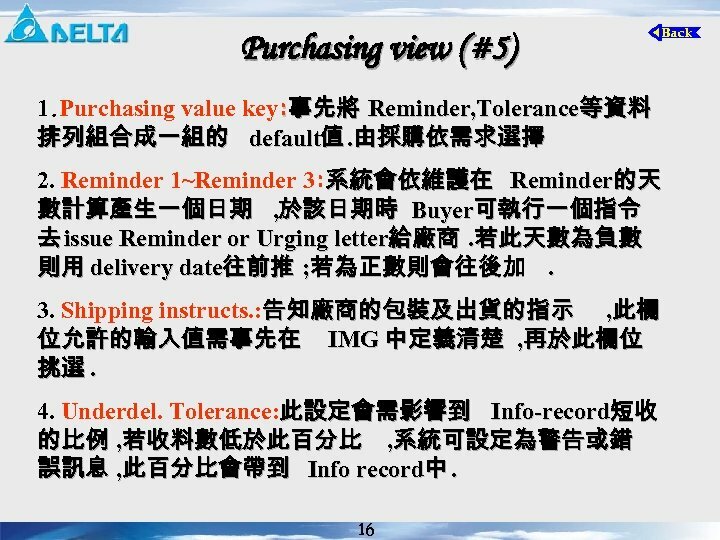 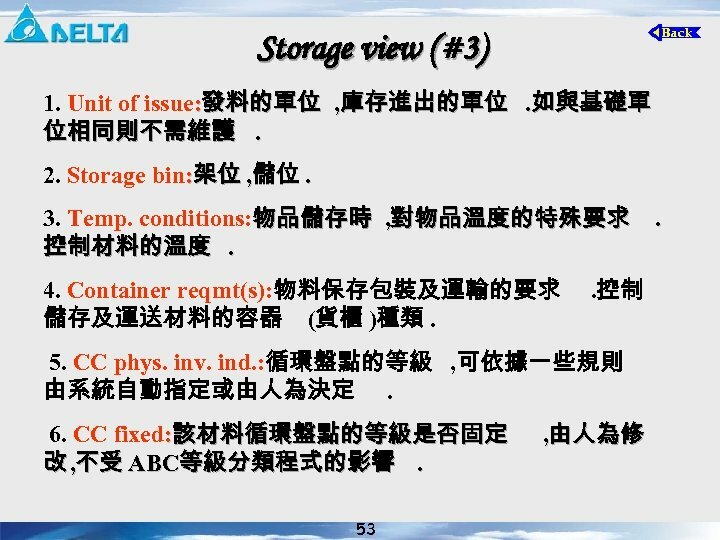 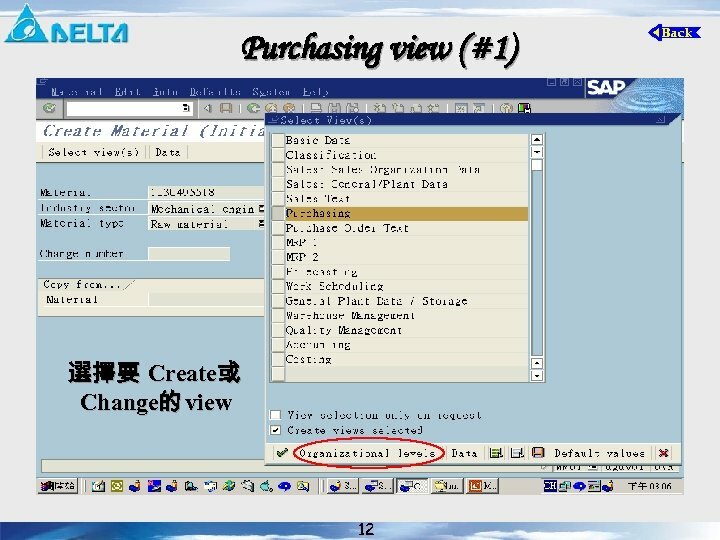 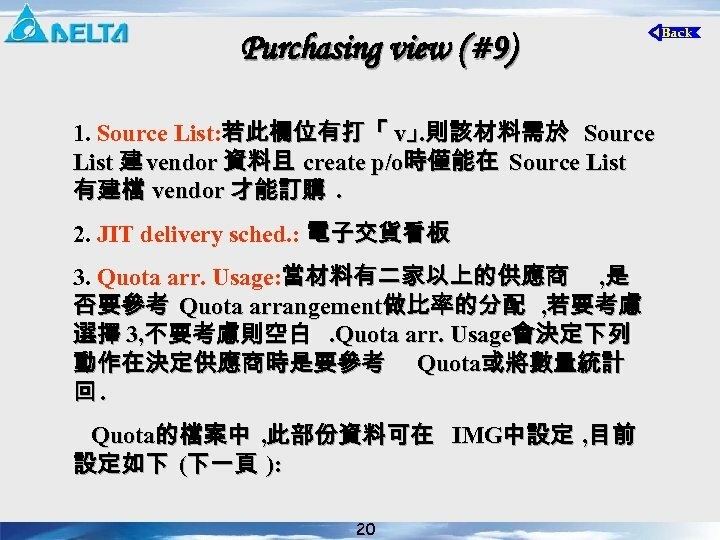 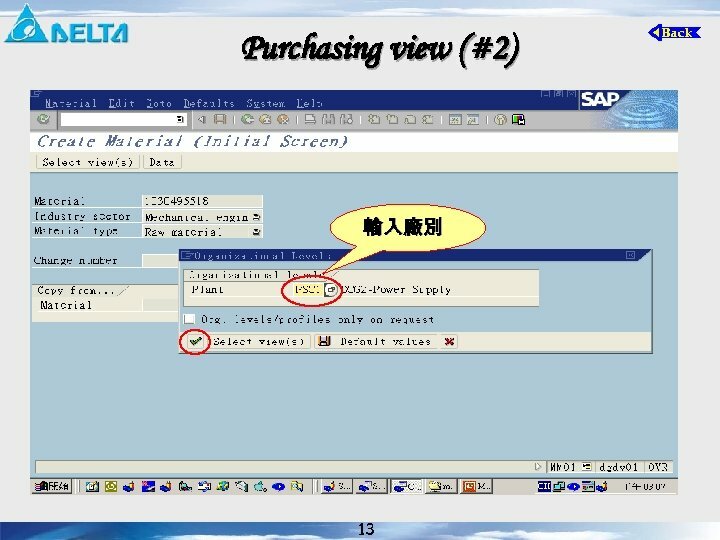 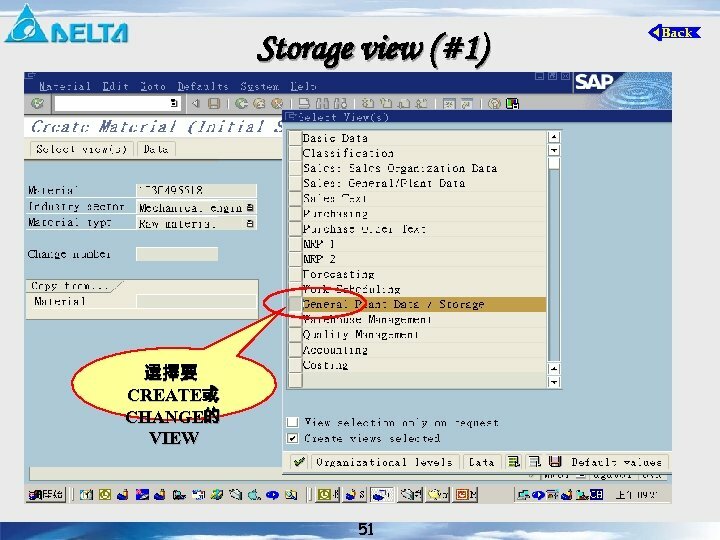 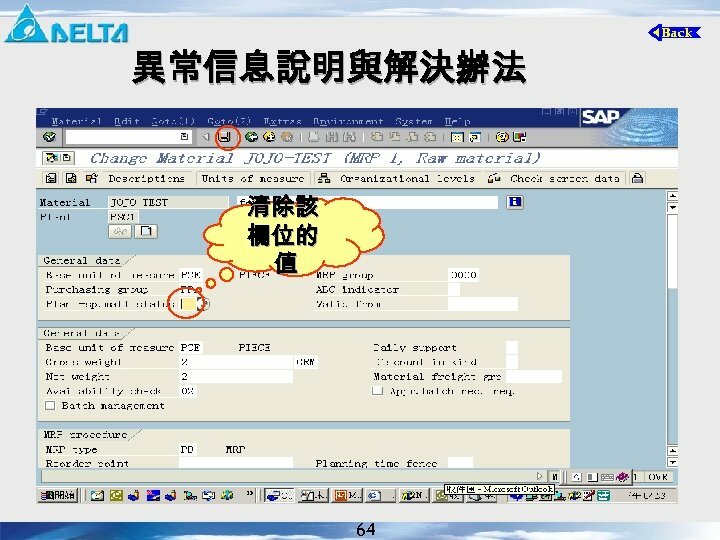 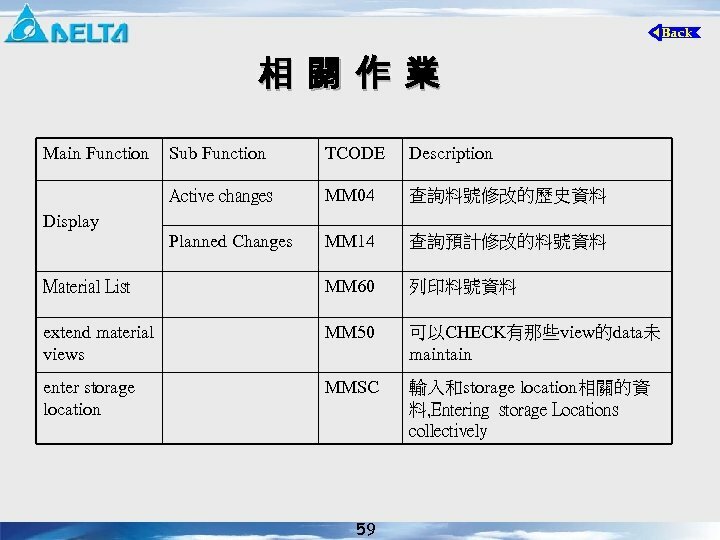 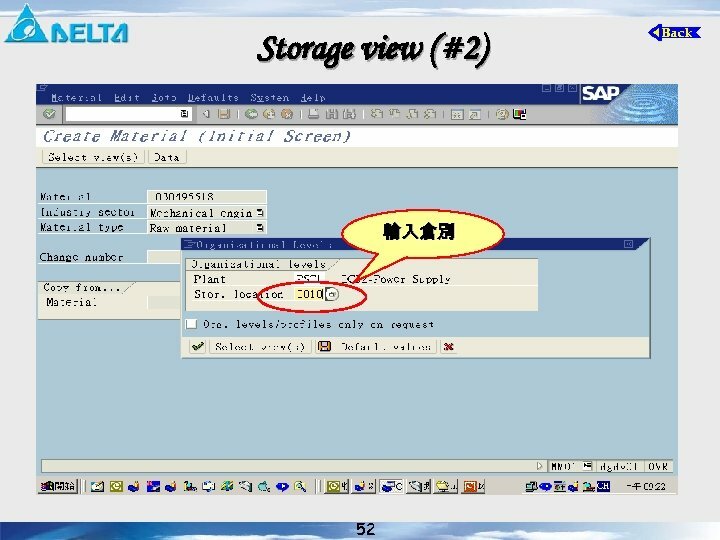 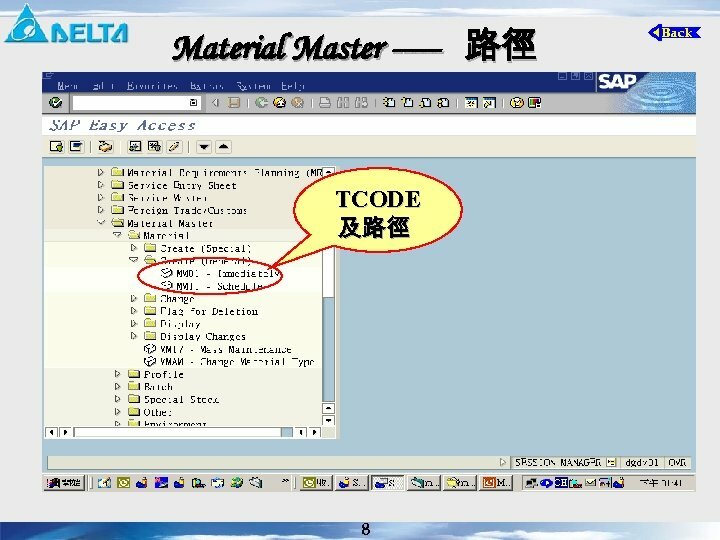 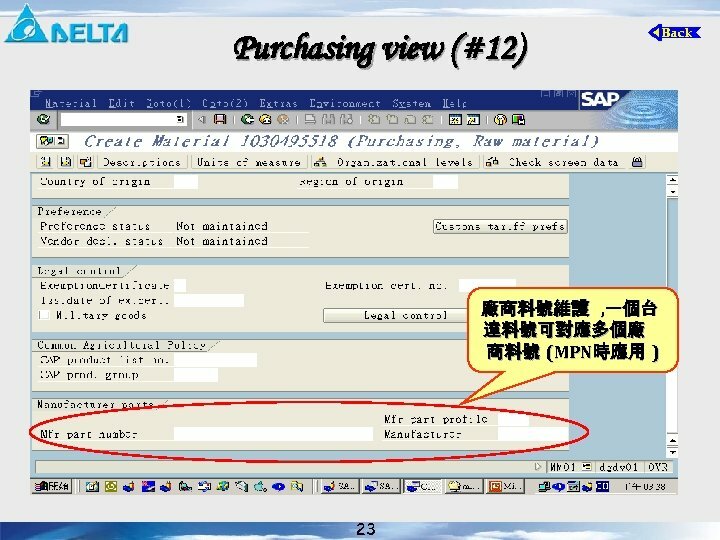 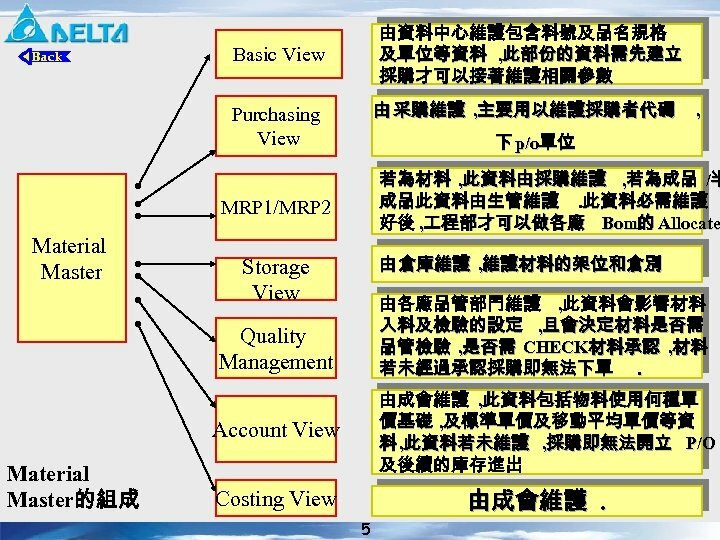 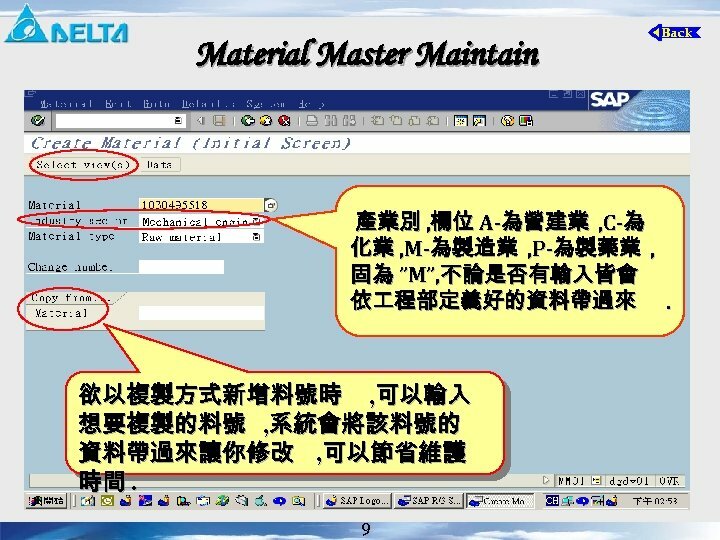 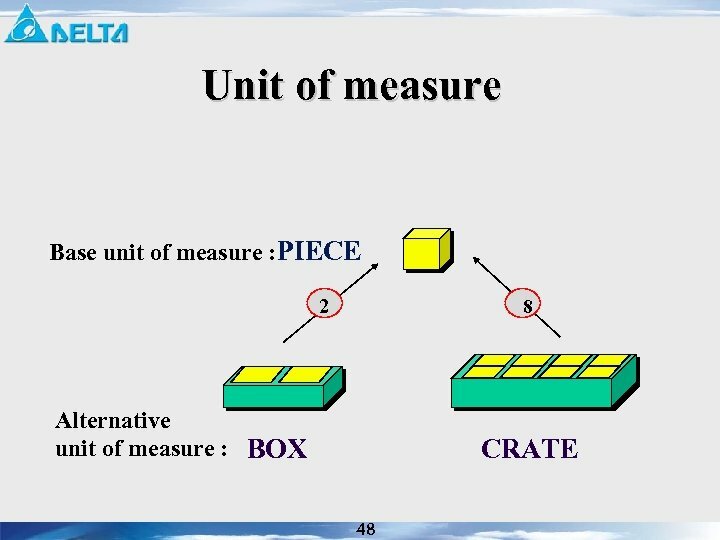 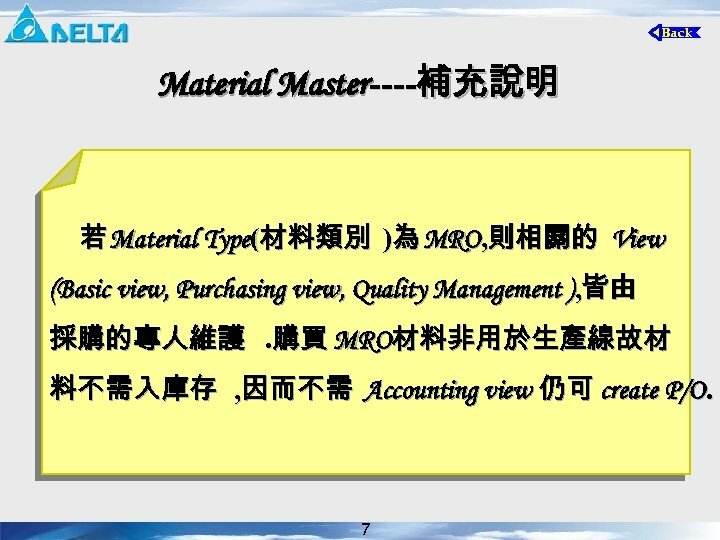 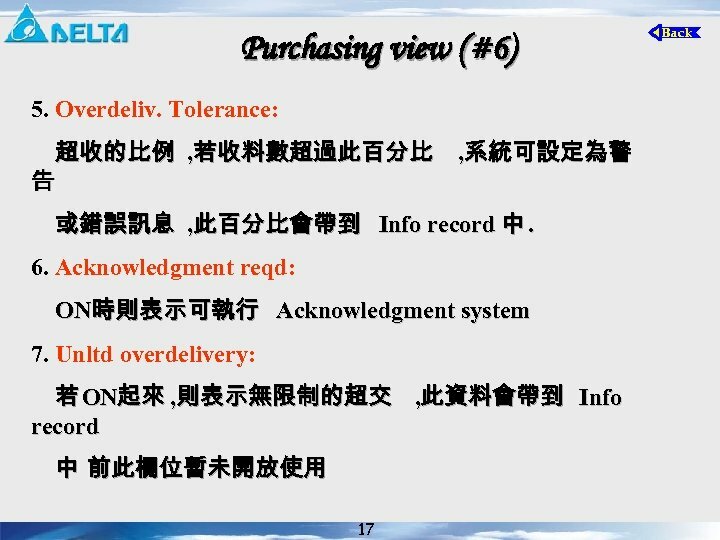 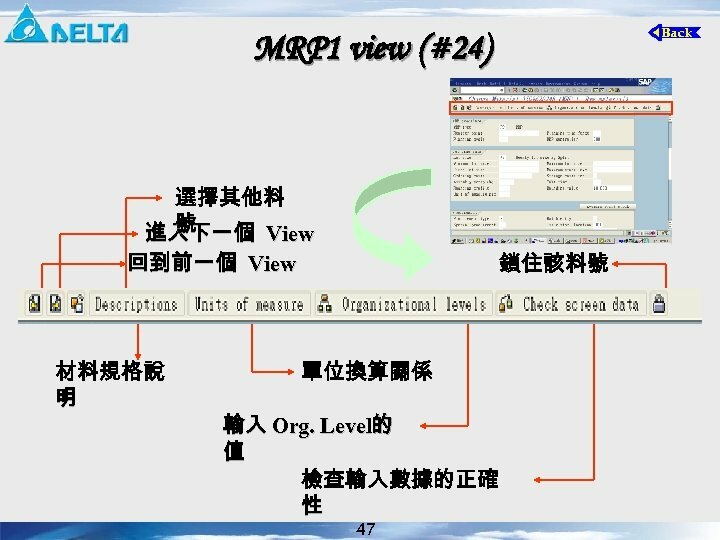 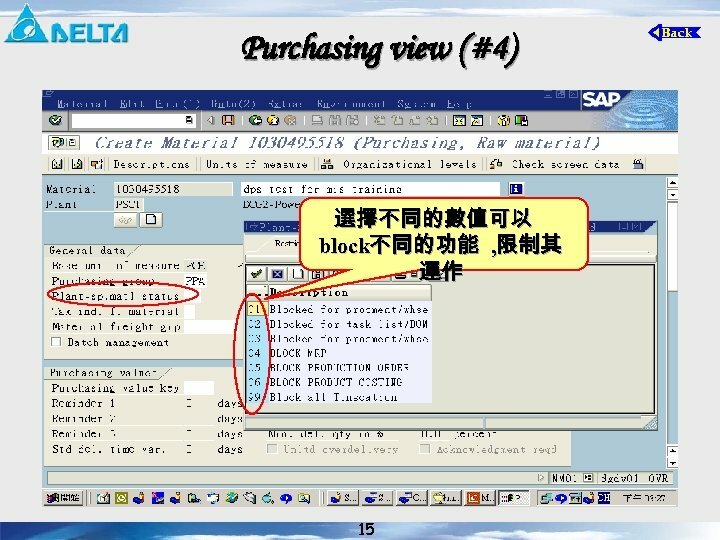 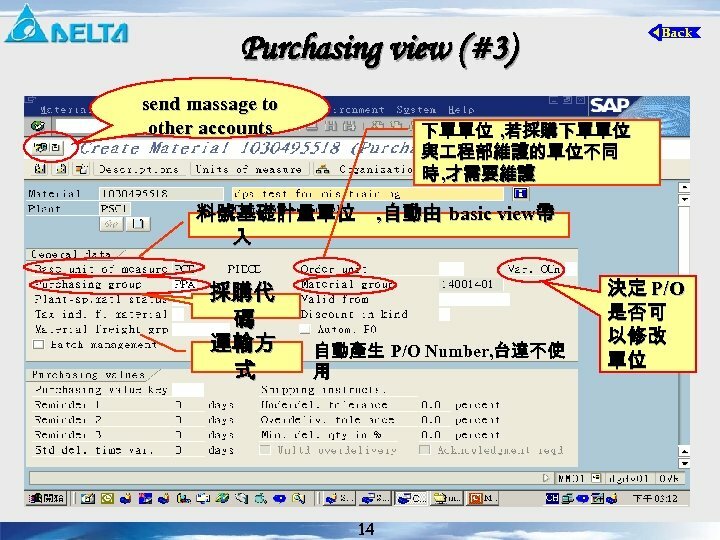 Quality Management 由成會維護 , 此資料包括物料使用何種單 價基礎 , 及標準單價及移動平均單價等資 料 , 此資料若未維護 , 採購即無法開立 P/O 及後續的庫存進出 Account View Material Master的組成 , Costing View 5 由成會維護.